In the flat expanses of Yuli Township in Hualien County you will come across a bridge not meant for pedestrians. It is quite a striking structure. Bright red in color the sides of the bridge arc high over the trains passing below. The bridge is easy enough to spot from a distance because there is nothing quite like its excessive splash of vermillion color for miles and miles around. In fact the red stands out with strikingly against the green grass. All that said, there is really nothing much to do here and you should all click a selfie and move on to the next attraction on your itinerary. 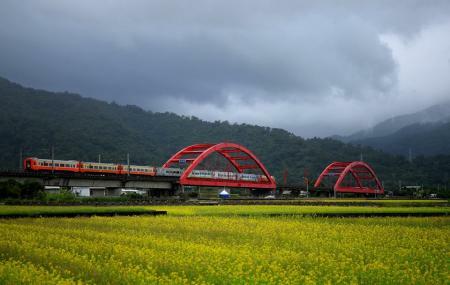 A red rail bridge cross green rice patty in the valley of Hualien. Many people came to this place to intercept trains for their photos. There is a famous Yu Li noodle nearby.